The ETMS aims at continuous observation and monitoring of territorial trends in relation to policy objectives of Territorial Cohesion. 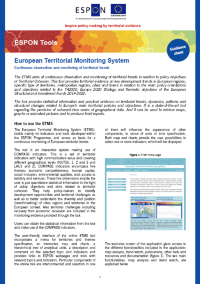 This tool, developed under the ESPON European Territorial Monitoring System project (ETMS), provides statistical information and practical evidence on territorial trends, dynamics, patterns and structural changes related to Europe’s main territorial policies and objectives. The ETMS tool makes use of indicators on five themes: economic competitiveness, human capital, social inclusion, environmental qualities, and access to territory and services developed, which were defined in the ESPON ETMS project. This is a set of limited number of territorial indicators with high communicative value and covering different geographical levels (NUTS0, 1, 2 and 3 and LAU1 and 2). These five dimensions enable the user to put quantitative statistical information in the light of policy objectives and aims related to territorial cohesion. They help policy-makers to identify development opportunities and territorial challenges as well as to better understand the diversity and position (benchmarking) of cities regions and territories in the European context. The user-friendly interface of this tool incorporates a menu for territories and themes specification, an interactive map and charts. The tool can be used to retrieve maps, graphs or animated pictures showing development and to produce brief reports.